Booka Bookshop are thrilled to present an evening with historian and BAFTA winning broadcaster and TV presenter Dan Snow as he talks about his new book, On This Day in History. 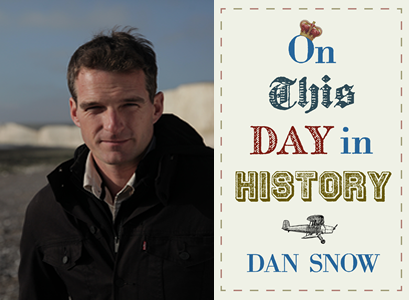 In ‘On This Day in History’ Dan Snow tells the story of an important event that happened on each day of the year. From the signing of the Armistice treaty at 11 a.m. on the 11th day of the 11th month in 1918 to Rosa Parks refusing to give up her bus seat on 1 December 1955, our past is full of all kinds of fascinating turning points. Dan lives and breathes history and this book offers a refreshingly direct way into his vast knowledge. With 365 carefully picked entries it provides a short, vivid, personal history of the world. And by explaining the past, Dan Snow helps us better understand our present — and future. There is no such thing as a day on which nothing happened! Don’t miss this chance to see and meet Britain’s favourite historian!